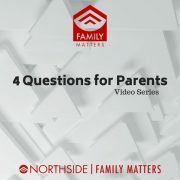 In this series of short videos for parents Rich Cochran, Family Pastor at Northside, encourages parents to raise their capacity to influence their children. Often times as parents its the simple small tweaks done consistently over time that make the biggest difference. Video #3: Quality time matters more than quantity of time, right? Video #4: How can I spare time for personal development when I am so busy with my kids? Bonus Video: My key to making it all work.